Error message during the installation of Panda: There was an error during the process and it failed to complete successfully. After completing the Panda installation wizard seamlessly, the program is not available from Start, Programs, the shortcut is not created and no icon is shown next to the Windows clock. You may experience these symptoms with the new and lighter installation file featured in Panda. Download and install the installation file below of your Panda product. Enter the Activation Code of your product when you see the following window and click Next. Once activated, click Close to close the activation wizard. After activating the product, you will be asked to create your Panda Account. 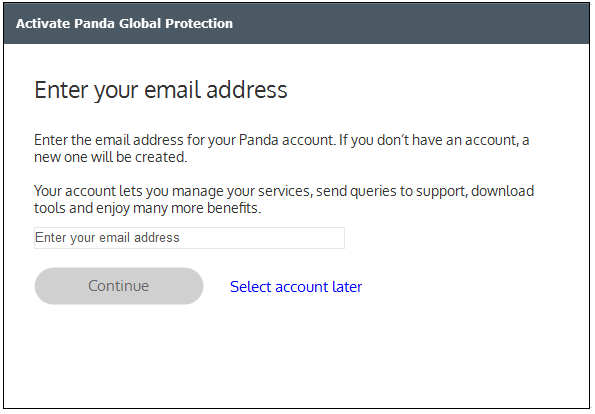 Enter your email address from the Account selection screen and click Continue to create your Panda Account. Go to your inbox and click Validate your account on the verification email. NOTE: If you had already created an account, just enter your password and click Continue. Finally, click Close to finish the Panda installation process. What is my Panda Account and how do I set it up?